Familial exudative vitreoretinopathy (FEVR) ( /ˈfiːvər/ FEE-vər) is a genetic disorder affecting the growth and development of blood vessels in the retina of the eye. This disease can lead to visual impairment and sometimes complete blindness in one or both eyes. FEVR is characterized by exudative leakage and hemorrhage of the blood vessels in the retina, along with incomplete vascularization of the peripheral retina. The disease process can lead to retinal folds, tears, and detachments. 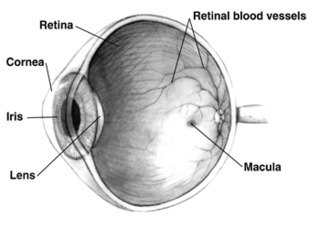 Retinopathy is any damage to the retina of the eyes, which may cause vision impairment. Retinopathy often refers to retinal vascular disease, or damage to the retina caused by abnormal blood flow. Age-related macular degeneration is technically included under the umbrella term retinopathy but is often discussed as a separate entity. Retinopathy, or retinal vascular disease, can be broadly categorized into proliferative and non-proliferative types. Frequently, retinopathy is an ocular manifestation of systemic disease as seen in diabetes or hypertension. Diabetes is the most common cause of retinopathy in the U.S. as of 2008. Diabetic retinopathy is the leading cause of blindness in working-aged people. It accounts for about 5% of blindness worldwide and is designated a priority eye disease by the World Health Organization. Macular degeneration, also known as age-related macular degeneration, is a medical condition which may result in blurred or no vision in the center of the visual field. Early on there are often no symptoms. Over time, however, some people experience a gradual worsening of vision that may affect one or both eyes. While it does not result in complete blindness, loss of central vision can make it hard to recognize faces, drive, read, or perform other activities of daily life. Visual hallucinations may also occur but these do not represent a mental illness. 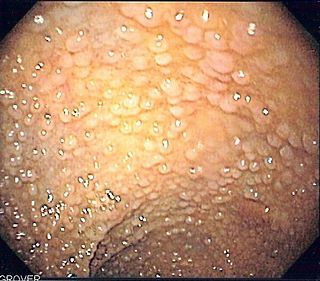 Familial adenomatous polyposis (FAP) is an autosomal dominant inherited condition in which numerous adenomatous polyps form mainly in the epithelium of the large intestine. While these polyps start out benign, malignant transformation into colon cancer occurs when they are left untreated. Three variants are known to exist, FAP and attenuated FAP are caused by APC gene defects on chromosome 5 while autosomal recessive FAP is caused by defects in the MUTYH gene on chromosome 1. Of the three, FAP itself is the most severe and most common; although for all three, the resulting colonic polyps and cancers are confined to the colon wall and removal can greatly reduce the spread of cancer. Familial dysautonomia (FD), sometimes called Riley–Day syndrome and hereditary sensory and autonomic neuropathy type III (HSAN-III), is a disorder of the autonomic nervous system which affects the development and survival of sensory, sympathetic and some parasympathetic neurons in the autonomic and sensory nervous system resulting in variable symptoms, including insensitivity to pain, inability to produce tears, poor growth and labile blood pressure. People with FD have frequent vomiting crises, pneumonia, problems with speech and movement, difficulty swallowing, inappropriate perception of heat, pain and taste as well as unstable blood pressure and gastrointestinal dysmotility. FD does not affect intelligence. Norrie disease is a genetic disorder that primarily affects the eye and almost always leads to blindness. In addition to the congenital ocular symptoms, some patients suffer from a progressive hearing loss starting mostly in their 2nd decade of life, and some may have learning difficulties. Pseudoxanthoma elasticum (PXE), also known as Grönblad–Strandberg syndrome, is a genetic disease that causes fragmentation and mineralization of elastic fibers in some tissues. The most common problems arise in the skin and eyes, and later in blood vessels in the form of premature atherosclerosis. PXE is caused by autosomal recessive mutations in the ABCC6 gene on the short arm of chromosome 16 (16p13.1). Wagner's disease is a familial disease of the eye that can cause reduced visual acuity. Wagner's disease was originally described in 1938. This disorder was frequently confused with Stickler syndrome, but lacks the systemic features and high incidence of retinal detachments. Inheritance is autosomal dominant. Coats' disease,, is a rare congenital, nonhereditary eye disorder, causing full or partial blindness, characterized by abnormal development of blood vessels behind the retina. Coats' disease can also fall under glaucoma. Rubeosis iridis, also called neovascularization of the iris (NVI), is a medical condition of the iris of the eye in which new abnormal blood vessels are found on the surface of the iris. Frizzled-4 is a protein that in humans is encoded by the FZD4 gene. FZD4 has also been designated as CD344. 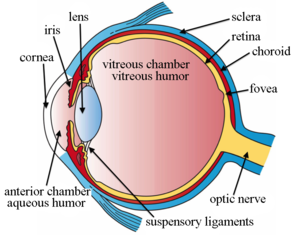 Norrin, also known as Norrie disease protein or X-linked exudative vitreoretinopathy 2 protein (EVR2) is a protein that in humans is encoded by the NDP gene. Mutations in the NDP gene are associated with the Norrie disease. Chronic mucocutaneous candidiasis is an immune disorder of T cells, it is characterized by chronic infections with Candida that are limited to mucosal surfaces, skin, and nails. It can also be associated with other types of infections, such as human papilloma virus. An association with chromosome 2 has been identified. Proliferative vitreoretinopathy (PVR) is a disease that develops as a complication of rhegmatogenous retinal detachment. PVR occurs in about 8–10% of patients undergoing primary retinal detachment surgery and prevents the successful surgical repair of rhegmatogenous retinal detachment. PVR can be treated with surgery to reattach the detached retina but the visual outcome of the surgery is very poor. Cerebroretinal microangiopathy with calcifications and cysts (CRMCC) is a rare genetic disorder, which affects multiple organs. Its hallmarks are widespread progressive calcifications, cysts and abnormalities of the white matter of the brain, usually occurring together with abnormalities of the blood vessels of the retina. Additional features include poor prenatal growth, preterm birth, anemia, osteopenia and bone fractures, and gastrointestinal bleeding. It is caused by compound heterozygous mutations in the conserved telomere maintenance component 1 (CTC1) gene, but its exact pathophysiology is still not well understood. ↑ Shastry BS (2010). "Genetic susceptibility to advanced retinopathy of prematurity (ROP)". J. Biomed. Sci. 17: 69. doi:10.1186/1423-0127-17-69. PMC 2933676 . PMID 20738858.